Hello y'all. What a fine place Charleston was. Steeped in history this is truly the old south. Settled by the English in 1670, Charles II 'gave' Charles Towne, named after himself of course, to eight of his closest buddies and they were soon joined by other colonists from England, Bermuda and particularly Barbados, whose people brought with them what was to become important rice cultivating techniques. Charleston was regularly under attack from sea and land raids by the Spanish and French, so the colonists erected a fortification wall around the small settlement to aid in its defense, some of this was recently discovered downtown by property developers. By the early 19th century Charleston was home to a cocktail of immigrants and until about 1830, the largest and wealthiest Jewish community in North America. South Carolina was also a not so wealthy home to thousands of slaves. At this point in history 40% of black people that were brought to North America came through Charleston to work as slaves for wealthy plantation owners and merchants. After the American Revolutionary War (1775-1783), in which the Siege of Charleston was one of it's major battles, this became the richest place in America. Nine out of ten of the wealthiest people in the country lived here. Rice grown in low-lying swampy fields using skills brought by African Slaves, the most sought after and expensive, created huge prosperity to Cha rleston's rich. Carolina Gold they called it and Charlestonian's spent it building grand homes, a theatre (America's first) and horse racing courses. 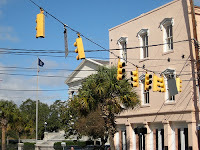 Some of the countries first banks opened here too and in fact the South Carolina National Bank of Charleston has operated as a bank on Broad Street since it was constructed in 1817. A private group of residents created the exclusive Charleston Library Society in 1748 and they helped establish the College of Charleston in 1770, the oldest college in South Carolina and the 13th oldest in the United States and still today a prominent landmark in the city. Then came the invention of the Cotton Gin, a machine invented by Eli Whitney that separated the cottonseed from the raw cotton, a task previously done by slaves and taking hundreds of man-hours. This revolutionized cotton's production and it quickly became South Carolina's major export, with a lot of it heading to the textile towns in northern England. Cotton was king and rice was gold. On Chalmers Street you can still visit one of the old Slave Markets. By 1820 the majority of the population in Charleston was black and all was not well. West Indian slave Denmark Vesey planned what would have been one of the largest slave rebellions in the United States but word was leaked and Charleston's authorities arrested the plot's leaders and executed them. This is not a part of history that South Carolinian's are very proud off but for the next 40 years the 8th State admitted to the Union, and one of the 13 colonies that declared independence from the British Crown during the American Revolution, became more and more embroiled in disputes with Washington's federal government. In December 1860 just after the election of Abraham Lincoln, who views on slavery were contrary to those in most of the southern states, the South Carolina General Assembly made the state the first to ever secede from the Union, citing one of the causes was the election to the presidency of a man "whose opinions and purposes are hostile to slavery." Subsequent historians have argued that Lincoln was more concerned with the break up of the Union, and it's reputation in Europe than abolishing slavery however. Five other states followed South Carolina's secession and a geographical line had been drawn across the country as the North turned their back on slavery. The south adopted their own constitution, elected their own president, Jefferson Davis, and Confederacy was born. After Texas joined the Confederacy in March 1861, all Federal forts and navy yards along the Atlantic and Gulf coasts were seized by the new southern government, all except one. Fort Sumter was occupied by Major Robert Anderson and 85 men from the First US Artillery. Throughout the winter of 1861 calls for Anderson and his men to leave the Fort and return north went ignored. The whole country watched Fort Sumter as the Union teetered on the edge of implosion. On April 11th Confederate Brigadier General P.G.T. Beauregard gave the final warning, an hour for Anderson and his men to surrender Sumter. Anderson refused and at 4.30am on April 12, 1861 the first shots were fired in what would become the bloodiest war in America's history. 970,000 people died, two-thirds of whom were soldiers, more than all other U.S. wars combined. 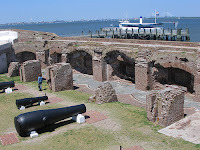 You can go still visit Fort Sumter, as we did, and an eerie monument to war survives (above right). Charleston took a very long time to recover after the Civil War ended in 1865. A year later a huge earhtquake damaged 2,000 buildings and the cities population slumped as did it's industry and it wasn't until after WWII that Charleston finally started to find it's feet. Miracously Charleston today looks like none of that ever happened. A place that was disfigured and scarred today stands tall and proud. For visitors in the 21st century the great thing is that due to a lack of money in the mid 20th century, Charleston could not afford to build new buildings, so they hung onto their existing ones, re-using them as opposed to knocking them down. How very un-American! Charleston's streets are grand and lined with huge live oaks. Many of the beautiful historic houses are open to the public and Rainbow Row along the waterfront with it's beautiful pastel coloured homes is absolutely stunning and a must for a walk or a horse-drawn carriage ride. These homes 'South of Broad' around Meeting St, Church St, Tradd St and East Batt ery originally built by rich merchants that in different circumstances would have been pulled down are now worth upwards of $7m. The French Quarter, once home I'd imagine to rowdy sailors and evening attractions that rowdy sailors seek on land, is now a tourist trap with the City Market at it's centre. 200 years old and formally a farmers market, not a slave market which is a popular misconception, it sells every kind of touristy memento you will need from your visit. The cobbled streets around the City Market is a bounty of small boutiques, restaurants and galleri es. King Street dissects the city north to south with student life at one end - ok if you like 18 year olds, and a lifestyle for the chic, like moi, at the other. Calhoun Street is lively with Marion Square at it's base, once a parade ground. The square has many monuments including one dedicated to John C. Calhoun, an outspoken proponent to slavery. Charleston does not hide it's past, although the proposed African American Museum is a long overdue recognition. 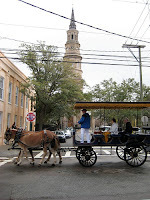 Charleston was known as the Holy City due to it's tolerance to all kind of religions. St Michael's Church stands on the site of the first Anglican Church built south of Virginia, built in the 1680's for English families arriving in the new world. The Old Exchange and Customs House built in 1771 and visitors can still the dungeons in the basement. Patriot's Point Naval & Maritime Museum is located in Mount Pleasant across the Arthur Ravenel Bridge. The 890ft USS Yorktown which saw service in WWII and Vietnam is now home to the aircraft carrier. 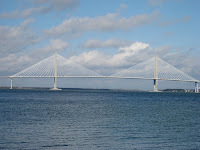 The Arthur Ravenel Bridge (above) is the longest cable br idge in the Western Hemisphere. Both Mt Pleasant, a place where many early Colonists settled, welcomed by the local Native American tribes and the Isle of Palms are both worth a drive. The Isle of Palms is a beautiful barrier island where turtles hatch on the beaches and families vacation. 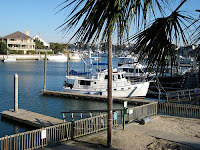 The Wild Dunes resort is here, as well as some the largest residential homes on the Atlantic coast. Other places of interest include the South Carolina Aquarium, which extends itself out onto the harbour and next to this is an IMAX theatre. Gibbes Museum of Art is housed in a Beaux-Arts building in the historic district and portrays 18th and 19th century American works and the Marina is a place to charter a boat, or just dream of owning one while having a pint. Charleston is also a busy port city as well, the 6th biggest by cargo value. An excursion worth doing is to one of the remaining plantation's, to which there are many. The stately Magnolia Plantation has been the ancestral home of the Drayton family since 1676. The 11th generation of Drayton's currently live there on 30 acres, although the whole plantation stretches to 500 acres and it is the oldest public gardens in America. Guided tours can be taken either by foot, train or boat and the Audubon Swamp Garden is nearby. Charleston lies very low with the Ashley and Cooper River running either side of the peninsula the city floats on. 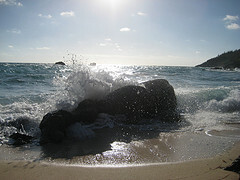 The weather was beautiful when we were there 10 days ago but the summer's are humid like hell. This part of the Atlantic is also very susceptible to hurricanes, so if you choose to go in the summer, good luck. As far as sports goes Charleston does actually have a professional 'soccer' team, which plays in the UCL, the league below the MLS. Called Charleston Battery FC they actually play, sadly, in one of only a handful of purpose built soccer stadiums in the States. Blackbaud Stadium holds 5,100 fans and they actually get about 2,500 for each home game. There is no shortage to great places to eat and drink. There are some college areas best avoided, unless of course you like that kind of thing but underage drinking did seem a problem. However we did come across some fun places, particularly around the Market and on Kings Street. A couple of my favourites were The Griffon (18 Vendue Range), Moe's Downtown Tavern (5 Cumberland St) and Pearlz Oyster Bar, with only me stupid enough to try the house favourite Oyster Shooter. 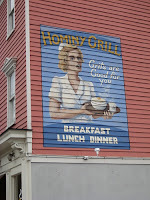 One night we had a superb dinner in a French place called 39 Rue de Jean and another place that I can highly recommend was Hominy Grill in Harleston Village for true lowcountry food. Grits are a bit of an acquired taste though!